Itchy throat, watery eyes, constant sneezing – sound familiar? 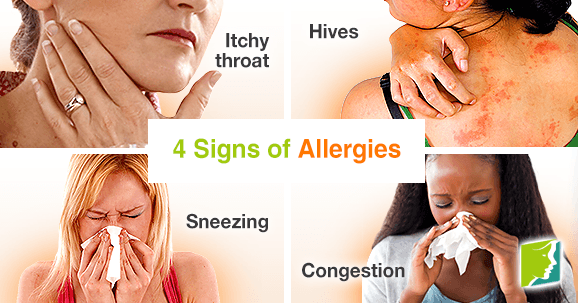 If you suffer from any of those symptoms, you may have allergies. The strange thing about allergies is they can suddenly appear at any age in life. You aren't necessarily born with them. Hormonal changes play a big part in allergies that develop later in life, and stress can be another cause. During menopause, hormone levels fluctuate, which affects the immune system and may influence how it responds to foreign substances. The most common symptom of allergies is an itchy throat. You will suddenly feel the need to clear your throat in an attempt to cure the itch. Aside from the itchiness, you may also experience a throat-closing sensation that can cause you to feel panic. If you start to feel the beginning of an itchy or tightening throat, take some form of antihistamine to lessen the severity of this symptom. The most obvious sign of allergies comes in the form of raised bumps all over the skin, otherwise known as hives. These raised, inflamed mounds are often quite itchy and may cause your body to feel as though it's on fire. Take an antihistamine to help with the itching, and a soothing topical cream to calm the inflamed skin. Sneezing is the body's way of expelling foreign matter breathed in, including allergens. For example, someone who is allergic to pets will most likely have a bout of sneezing when in close proximity to animals. Allergies can inflame nasal passages, leaving you feeling congested. Congestion can then lead to a headache or migraine. Congestion is a fairly common symptom of allergies, and the pain can be managed by taking a decongestant. Often, common cold symptoms can mirror allergy symptoms. How do you tell the difference? True allergies can leave you feeling fatigued and congested – also the symptoms of a virus. The difference, however, is that allergy symptoms will persist much longer than the common cold. If you are exposed to an allergen that you are truly allergic to, you will feel the symptoms almost immediately, whereas symptoms of a cold might gradually increase over a few days. If you experience any of the symptoms listed above on a fairly regular basis, it may be worthwhile to visit your doctor to be tested. Allergy panels can pinpoint exactly what your body is reacting to, making life with allergies easier to navigate. Follow the link below for further information on how to deal with allergies.